In spite of the criticism levied against it, I tend to give iTunes the benefit of the doubt. It’s there, it does a serviceable job of managing and playing my music, it functions as a device hub and it does a good job of it. Tim Murrison’s BitPerfect 2.0.1 (Mac App Store link) shows what iTunes music is capable of and is an audiophile’s dream. 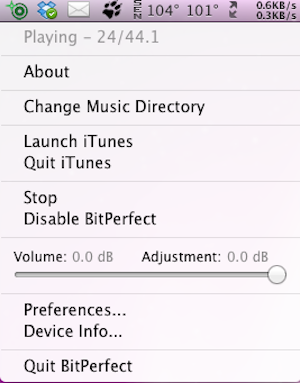 BitPerfect opens a world of clearer, more present sound that you never thought was possible from your Mac’s speakers. BitPerfect is sleek, minimal, unobtrusive, and powerful. The program, which resides in your OS X menu bar, can be quickly enabled or disabled with a click of the mouse. Launch BitPerfect for the first time, designate which audio library you want it to use and it’ll quickly scan your iTunes library, inform you that it’s made changes to the library and is ready to begin working. Enable BitPerfect, run iTunes as you normally would and the sound difference is like night and day—BitPerfect upscales the audio sent to the output device. Add in a slew of preference and customization options and there’s enough to keep happy any audiophile within the vicinity . The bad news is that BitPerfect doesn’t play as well as it could with the operating system. In tests on my Mac Pro running OS X 10.7 and my MacBook Pro running OS X 10.9, the application tends to hijack even system level audio functions. It also muted the audio on YouTube video playback, OS audio prompts under OS X 10.7, and it switched the output device from my MacBook Pro’s internal speaker to my Apple TV under OS X 10.9. You can always quit BitPerfect when you're not listening to iTunes. 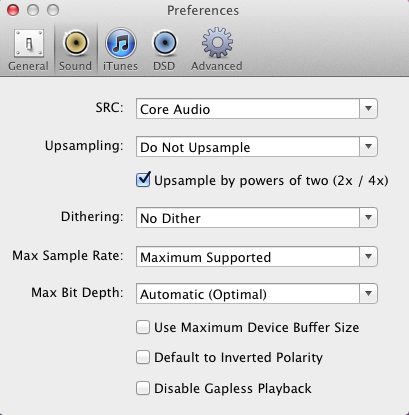 BitPerfect will show you what your iTunes music library is truly capable of sounding like in a nigh-miraculous way. Now all it has to do is learn how to play nice with its surrounding operating systems and it’ll be set.